Oxidation in a Brown Velvet, see circled areas. Oxidization happens with all forms of hair/fur. 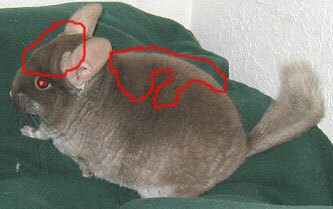 In chinchillas, it is most noticable in Beige and ebony crosses, violets, and very dark standards. Only sapphires never appear to oxidize. In humans it creates some amazing natural highlights. Oxidization can happen from age or from high ammonia levels and poor living conditions.